Let's say that for a time I have been researching a specific question or topic on my own and I've come up with an answer. The answer seems to me to be complete and satisfactory to my needs. At this point I just could go ahead and use the answer or file it away or whatever, but I feel that this result could be of benefit to the community. Now, many other knowledge-sharing communities have article sections where users can submit this kind of result so that other users can benefit from the research even if it's not an open discussion. The Stack Exchange model has no explicit function to submit articles. My question is, if I have such an article from my own research that I want to share, is it good conduct to form a question and a solution from the article and post them both together? I think this would expose the result to the benefit of the community without violating the question-answer structure. Also, by not accepting my own answer right away I could leave the question open for others who maybe have researched similar topics to contribute. Go for it - the purpose of the site is to increase useful knowledge in Q&A form. Of course, "together" should not mean in one post - the Answer should be separate. Others can add their own Answers, and good/bad ones will be up/downvoted (hopefully in that order). Should I answer my own question? Although if the article is really long, just a link and summary text would be enough, don't post an encyclopedia. "Article" makes me scared a bit, we are above all a Question & Answer community. But yes, if the Question end of it is a proper question, and the answer portion is a proper answer then (at the moment atleast) I can't see anything really wrong with it. But yes, it would be best to not accept your own answer immediately, You never know what you may find. This is a good idea for two reasons. First, it shares valuable knowledge with the community, and addresses a specific issue in a way that fits in with the Q&A format. Second, since you are asking a question, and there are people here to answer it, you may get a new, interesting answer you'd never considered before. This makes the question even more valuable, since there are now two approaches to a solution. One potential downside is that people may look at it unfavorably as rep-farming. A countermeasure to this is to make the post (or even just the answer) Community Wiki. If that's not a concern of yours, though, then no need to worry about such attitudes. 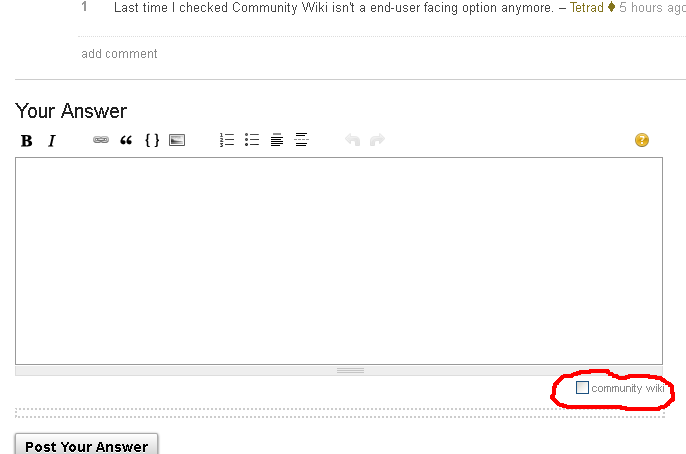 To mark as a Community Wiki, simply check the box "Community Wiki" before you post your answer. As Tetrad points out, this checkbox option is only available for answers. There are several ways for a question to become CW, including being edited 10 times (or by 5 different users), or a collecting 30+ answers. Questions can also be flagged for a moderator to make the conversion. More information on Community Wiki and how it works is available in this answer. Not the answer you're looking for? Browse other questions tagged discussion questions accepted-answers . Should we, and if so where, post solutions to problems if we use a solution which isn't one of the answers? How do we feel in regards to questions that ask if a certain piece of technology is capable of a certain feature?